Love is in the nail, everywhere I look around! I’m not a big fan of Valentine’s Day, but since hearts are cute and manicures are fun, let’s make some DIY heart ❤ nail stickers. First, paint two coats of nail polish directly onto a roll of scotch tape. We painted our roll magenta, light pink and white. Go do your thang while the paint dries. Once the paint is dry and the roll is manageable, take small precision scissors and cut little hearts out of the painted tape. The hearts should be about 2 – 4 mm in diameter. 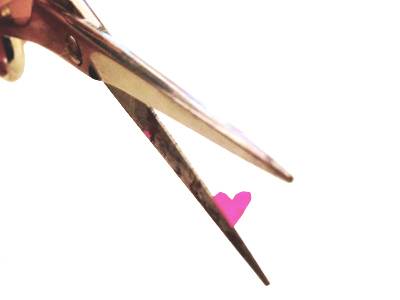 Immediately transplant the heart from the scissors to your nail bed, handling it as little as possible. Be playful with the placement of the hearts – mix it up! Alternate the hearts’ shapes, sizes and direction for a cute, scattered look. 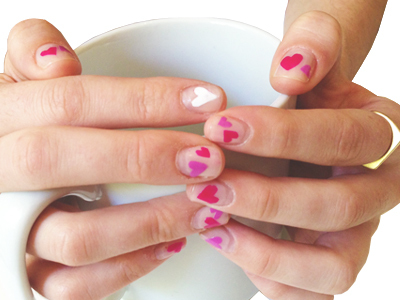 Once you are satisfied with your hearty nails, apply a layer of topcoat to seal the stickers to your nail. I hope you use this demo to design your own nail stickers of different shapes, sizes and colors! Show me what you got!